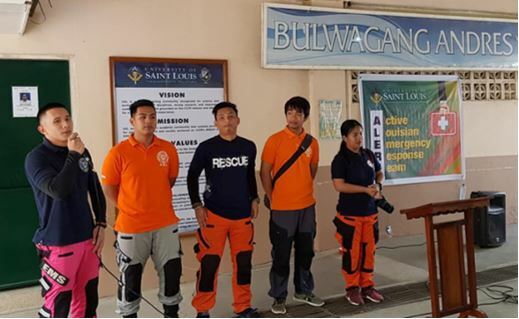 In support of the Congregation of the Immaculate Heart of Mary (CICM) advocacy on Disaster Risk Reduction and Management, the University of Saint Louis (USL) launched last Sunday, March 24, 2019, the Active Louisian Emergency Response Team (ALERT), an organization of trained volunteer responders in cases of emergency. As a benchmarked practice from Saint Mary’s University (SMU), Bayombong, Nueva Vizcaya, Rev. Fr. Renillo H. Sta. Ana, CICM, USL president, invited some alumni and officers of the Marian Emergency Response Team (MERT) to share how they started the emergency response program in SMU. The team also shared their experiences of being part of the MERT. In the message given by the University President, he shared how he witnessed the MERT to have been so responsive and dependable during emergency and in critical situations in the school and in the community. He also shared how he saw the members grow as individuals and become successful in their respective careers. One of the MERT alumni is already working at the Municipal Disaster Risk Reduction and Management Office (MDRRMO) of Bayombong, Nueva Vizcaya. The launching program culminated with the ALERT oath by the employee and student volunteers including some members of the Administration who were in attendance. Lodged at the Office of the Vice President for Administration, the ALERT shall soon become an official organization composed of employee and student volunteers. Mr. Bryan T. Urita, Academic Extension coordinator and faculty of the School of Engineering, Architecture, Interior Design, and Information Technology Education (SEAIDITE), and Mr. McKevin P. Romualdo, Academic Extension coordinator and faculty of the Senior High School, were designated as ALERT advisers. ALERT volunteers are expected to be tapped during emergency-related situations in the University. The membership is still open to interested students and employees. Interested members are invited to visit the Community Engagement and CICM Advocacies Office (CECAO) and look for Mr. Urita. The establishment of the ALERT organization as an arm to promote campus safety, security and disaster preparedness is one of the programs of USL’s funded projects under the Commission on Higher Education’s (CHEd’s) Institutional Development and Innovation Grant (IDIG). The IDIG project, which is the establishment of the Center for Sustainable Development and Disaster Risk Reduction and Management in USL, aims at promoting disaster preparedness and disaster risk reduction advocacies. The launching was highlighted with the rappelling exhibition of the MERT team.